We've been using the Olympus OM-D E-M1 for a number of months now. This compact system camera has seen us through many different shoots - from personal snaps to product images that you might have seen in some other Pocket-lint reviews - made all the easier thanks to its high-end specification. If you're looking for a small and light interchangeable lens camera then they don't come much more complete than the E-M1. It takes it design cues from the older E-M5 model which was inspired by the decades-old OM DSLR series. 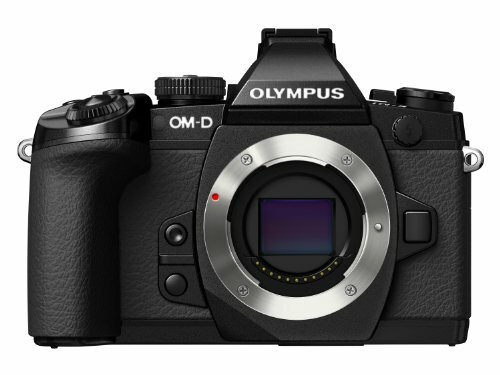 However, the E-M1 is the embodiment of the new age: in a sense it's the camera to mark the end of the Olympus DSLR as there will be no "E-7" model. Instead the E-M1 takes compact system camera up a notch by showing it can cater for all demands: it accepts Micro Four Thirds lenses but will also get solid performance out of Four Thirds lenses via an adaptor too. New design, new sensor minus the optical low-pass filter, an updated electronic viewfinder (EVF), a space-age image stabilisation system unlike the competition and plenty more besides. Is there anything the E-M1 can't do? It's far from a budget camera, but is it worthy of its price tag and can its small scale deliver things just as big as an equivalent DSLR? There's nothing entry-level about the OM-D E-M1. Even though it's relatively small - particularly as we're more used to lugging around a full-frame DSLR instead - the body is well designed for this scale. It's weather-sealed, has a sturdy magnesium chassis and a new rubberised finish that's less "slippery" than the earlier E-M5 model. We preferred the look of the E-M5's more metallic finish, but then the E-M1 is more practical. Such practicality doesn't carry through so well if you don't know much about photography though. Because, make no mistake, the E-M1 is a serious piece of kit and, if you're new to Olympus, then it takes a bit of time to learn your way around. Just small things such as, for example, the exposure compensation and aperture value adjustments being controlled by front and rear thumbwheels respectively rather than the other way around. Nothing wrong with that, but if you're used to another brand it'll feel like it's reversed. But the longer you spend exploring the more you realise once you have adapted to the Olympus way that there's loads of detail available here. Dig into the extensive menus - although we're still not huge fans of the layout - and there are options for pretty much everything an advanced photographer could want. Which dial controls what, which direction of rotation actions the command, the EVF display style, various grid displays for framing, subtle white balance adjustment. Too much to list in full. The physical controls match the customisation levels too, with our favourite feature being what Olympus calls the "2x2 dial control". A flick of this mini lever gives the two thumbwheels a dual lease of life, with a secondary function available when in position two. Let's say you've just used to rear thumbwheel to stop down to f/8, but want to tweak the white balance - a simple flick of the switch and the same thumbwheel will control both without the need to dig into the menus. It's also possible to customise it to suit your own personal preferences. We're reviewing the OM-D E-M1 at an interesting time. We're a little late to the party following the product's release but also because the more affordable Fujifilm X-T1 has also arrived to the market. Now that's interesting because Fujifilm has gone all out in the electronic viewfinder department and this, for us, puts Olympus in second place. Perhaps that sounds a bit harsh because we genuinely love the E-M1's built-in EVF. The 2.36m-dot panel is the same as the VF-4 accessory that joined the earlier Olympus E-P5 and, although it's not as physically large to look at compared to the Fujifilm X-T1, its 0.74x equivalent magnification is still large, responsive, handles various lighting conditions well and lag performance is up there with the very best. Low-light conditions do make for a less "clean" experience compared to an optical viewfinder because of some visible image noise in the preview, but all things considered the E-M1's EVF is a class act. It also features an auto brightness adjustment option to ensure optimum brightness depending on the ambient light. Underneath the EVF is a 3-inch, 1.04m-dot LCD screen mounted on a tilt-angle bracket. We found ourselves using this just as much as the EVF in practice, largely because of how responsive Olympus' autofocus system is. It means using the camera at waist-level with the screen titled outward is no problem at all and faster than any DSLR's live preview mode. That's just one of the benefits of a compact system camera's on-sensor focusing method. There are other fun yet really useful features to adjust not only the preview but also the captured result - something only possible using an electronic preview. The "Color Creator" is the prime example; a hue/saturation tool that can be controlled via the two thumbwheels to shift colour cast and saturation in real time. If you want a slightly more washed-out look, a blue hue for a certain panache, or whatever your creative whim, then it's possible using this feature. The second option is a highlight and shadow adjustment tool that has its own dedicated function button on top of the camera. And as it's electronic you'll see exactly what these adjustments make in the viewfinder as well as on the rear screen. Don't like what you've captured? Then there's always the raw file to revert back to if you want a fresh start. Assuming, that is, that switch on raw capture. When it comes to autofocus performance there are few competitors that can match just how well the Olympus OM-D E-M1 performs. It's really quick and consistently accurate thanks to Olympus's fastest autofocus yet. Although in the E-M1 it's titled "Dual Fast AF" as the camera can cater for those older Four Thirds lenses as we mentioned. The autofocus system has dedicated phase-detection pixels on the sensor itself but these are only used when a Four Thirds lens is attached. A slight bump in the road for this review is that we've not got any older lenses to test just how well it can perform. On the Micro Four Thirds lenses front, however, the E-M1 flies like a rocket by using its on-sensor contrast-detection system. There are some times when you'll spot it "hunt" focus but it's over so quickly it doesn't matter. Out of the OM-D models available the E-M1 is the only one to offer an 81-point focus array compared to the 35-point array in the earlier E-M5. For us that's not a major deal, but the biggest difference will most likely be felt by those using the older lenses. Having more focus points and indeed smaller focus areas can have its benefits of course, although the spread of the array across the frame doesn't differ between the newer and older camera. From fast autofocus to fast burst and shutter speeds, the E-M1 sure is all about being quick. The maximum 1/8000th sec shutter speed and 10fps burst mode is ideal for freezing fast moving action, and the continuous autofocus system is probably the best we've yet seen from a compact system camera. Take that as you will though: a similar price DSLR will still outsmart the E-M1 when it comes to subject tracking, because not one compact system camera seems to have this area wrapped up just yet. Then there's the "Olympus special": its 5-axis image stabilisation system. Increasingly we've seen other manufacturers claim to offer 5-axis systems, but they're half-baked ones that depend on some digital stabilisation methods to seal the deal. In the case of the Olympus that's not the case: the sensor "floats" between magnets and can therefore counter any given tiny movements in a three-dimensional way. The sensor can counter for pitch, yaw, vertical and horizontal motion, as well as rolling movements. Not only is it clever but it also works brilliantly, particularly for 1080p movie capture, just like it did in the earlier E-M5 model. The only downside to the technology is an ongoing subtle “hissing” sound, irrelevant as to whether the stabilisation system is on or off, which is feedback from the way the sensor is mounted. There's also Wi-Fi on board that works just like the Olympus Pen E-P5 model. This is of interest because instead of tapping in long-winded codes the camera presents a QR code on its screen and a smartphone or tablet app can quickly recognise this in order to pair to then accept images or offer up its wireless connectivity. Very smooth. But the one ongoing bother we have with the E-M1 is its limited battery life per charge. For a camera that costs over £1,000 it's not great, not at all. We get that all the electrical gizmos and clever features dig away at how long a charge will last, but no compact system camera seems to have found a way to counteract this. Another problem is how inaccurate the battery display is - it relies on a three bar system that can be showing two thirds full and then suddenly be flashing orange as if the battery is going to die half an hour later. Even then we've shot dozens and dozens of shots with the battery alert flashing without knowing how long or how many frames were possible. The best solution is to grab yourself a battery grip to enhance the longevity of charge. After all, two batteries are better than one, but then it does add to the overall cost and physical size of the camera. We actually prefer the look and feel with the battery grip on, as a full four-finger grip can nestle around the camera rather than the more typical three-finger grip with the pinkie underneath that occurs without. Alternatively buy a spare battery that you can always keep charged and available in a spare pocket. When we saw the earlier E-M5 model back in 2012 we were genuinely surprised by how good its image quality was because, for a Micro Four Thirds sensor, that was the model to beat. The Olympus E-M1 takes that concept and betters it all round by producing excellent image quality. There's a brand new sensor on board, even if the 16-megapixel resolution reads much the same as the earlier E-M5 model. But the crucial difference in the E-M1 is the removal of the optical low-pass filter (OLPF) that gives images even more definition and sharpness. We've seen side-by-side tests against other cameras and when picking blindly images from the E-M1 - and Fujifilm X-E2 - were often the ones we would gravitate toward. And that's in a group of other very well equipped APS-C cameras. We wouldn't say that the E-M1 is a giant leap ahead of the E-M5, however, and part of the results achieved will depend on the lens that you use. In general we've been using the 12-50mm kit lens which is pretty decent, but something like the 45mm prime truly shines. The E-M1's native ISO 200 produces fantastic shots and there's even a new "low" setting for ISO 125 or ISO 100 options should you want them. There's less dynamic range in these low options but that won't impact JPEG images all too much. There's plenty of detail available, although sometimes JPEG processing can be a touch over the top. For a sensor of this size the assumption would be that the E-M1 would perform less well at the middle ISO sensitivities, but it's just as good as many APS-C sensors. Just like in the E-M5 Olympus seems to have pulled off some kind of magic. Not only is there loads of detail, but image noise is kept at bay, while exposures and colour look accurate right up to ISO 1600. At the higher ISO settings, such as ISO 3200 and above, there are signs of colours becoming more muted. But even so images are passable. We're not sure why ISO 25,600 needed to be added to the features list as its results are a step beyond - and yet we did manage to snap at ISO 16,000 with some success. Used at the right scale and such super-high sensitivities can have their place. If you're going back and forth worrying about whether a smaller sensor is going to not do justice to image quality, then have no fear. The main difference between this and a larger sensor is the depth of field control that's on offer - you'll need to opt for wider-aperture lenses if you want that truly soft, melty background bokeh. But then Olympus's lens selection is broad and continues to grow, as does third party support. As well as the usual auto and manual modes to cater for all uses, Olympus also has a range of art filters on offer too. These built-in filters are presets - they offer less range than the Color Creator highlighted earlier - and range from dramatic tone to sepia, through to black and white and diorama. There's no doubt that the Olympus OM-D E-M1 is a credible bit of kit. As far as compact system cameras go there's nothing else as fully featured on the market, nor as all-round capable as this slice of retro-inspired cool. The big hurdle for most will be the formidable price. At £1299 for the body alone it's a long way from budget and will time and again bring up the "is it as good as a DSLR?" debate. The answer is a mix of yes and no. Yes at almost every stage because it's super-fast, superbly built, feature rich and produces image quality that's not trying to keep up but is just as good. But no because of a couple of hurdles: the battery life is a long way off an equivalent priced DSLR, while continuous autofocus - despite being the best we've seen in a compact system camera - won't outsmart something like the Canon EOS 70D. That's the critical take. And yet the more we've used the E-M1 and got used to its slightly unorthodox layout, the more we've realised just how accomplished a camera it is. It's specialist and complex, but in a good way; it's incredibly detailed and leads the way in the compact system camera category. It's only real issue? The Fujifilm X-T1, if you can ignore the gap between the number of lenses available in each respective system. As Olympus wraps up its DSLR line it had to be sure that its modern-world replacement would be up to the job. And the OM-D E-M1 is the proof: a camera that's not only visually stylish but a classy performer too. If you're looking for an accomplished all-rounder then there's arguably no better option in this category.